PHILOMENA isn't a bad film. But it isn't a good film. It's a perfectly serviceable TV weepie with a superior cast. The movie spends a lot of time self-mocking human interest stories for being schmaltzy melodrama designed to cater for the weak and stupid. But it can't escape the fact that this is basically what PHILOMENA is. It could've been more. But bound as it is by the truth of the story, it can't get spiky enough to do anything interesting. Let me explain. Philomena (Dame Judi Dench) is a real life Irish woman who got knocked up, consigned to a convent, and had her son forcibly adopted when he was a little boy. Fifty years later, she enlists the help of an ex-BBC journalist to find him, as it turns out, in America. There's some interest in seeing a lapsed Catholic of some wealth and cynicism help a woman who has been so obviously wronged by her Church, but still has faith and forgiveness in her heart. We could have had a really fantastically interesting philosophical debate here, but apart from one scene in which Philomena refuses to confess, the screenwriters seem to shy away from such a controversy. Similarly, without spoiling anything, there are aspects of the son's life that Philomena, given her faith, could have struggled with. But no, as if by the shake of a magic wand, she is perfectly fine and understanding and modern and lovely. And then, take the journalist, Martin Sixsmith (Steve Coogan in an admirably modulated performace). He could have had to confront some real issues about whether or not to exploit Philomena's story for financial gain. But circumstances let him off the hook. The result is a film in which two basically nice people go on a road trip and any possible issue that might have caused some problems, some fire, some provocation, some debate, some nuance, are neatly handled. This creates a rather banal and soupy experience better suited to the Hallmark Channel than the London Film Festival. And the jokes that are in the movie - while properly laugh-out-loud - are all in the trailer. 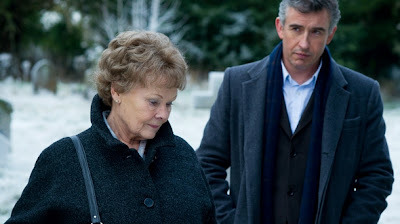 PHILOMENA has a running time of 98 minutes and is rated 12A in the UK. PHILOMENA played Venice 2013 where Steve Coogan and Jeff Pope won Best Screenplay, and Stephen Frears won the Queer Lion. It also played Toronto and London 2013. It will be released in the UK, Ireland and Iceland on November 1st, in the USA on November 22nd, in Sweden on December 6th, in Italy on December 19th, in Hungary on December 26th, in France on January 8th 2014, in the Netherlands on February 13th, in Germany on February 27th and in Japan in March.